More than one article has proclaimed that this is the post-PC era. And the numbers are backing that up, at least in education. According to recent market data figures, the iPad is replacing sales of PC computers in the education market for the first time ever. In a note to investors on Tuesday, Needham & Company’s Charlie Wolf reported that PC education shipments fell by 265,000 units (or 13.9 percent) from this time last year. Meanwhile iPad sales in the K-12 market reached nearly a million units — double what it was in the same period in 2011 — which makes for what he believes is “definitive evidence” that the Apple tablet has been “cannibalizing” PC sales in the education sector. 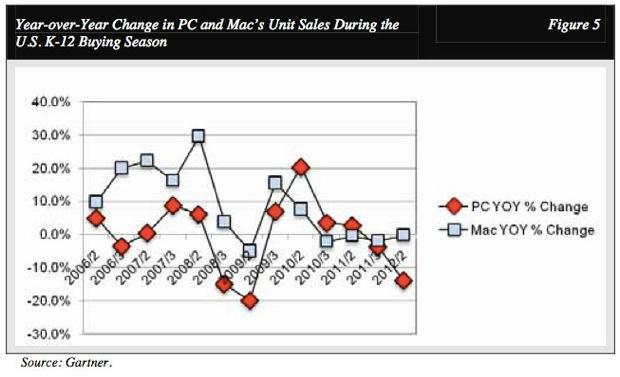 As mentioned, Macs remained steady in its sales to schools and students. Even so, the iPad still dominated, selling nearly twice as much to these customers. At least there’s the U.S. business sector, and Macs do continue to expand in that market, with a 56.6 percent year-over-year growth. (PCs, on the other hand, showed an 8.8 percent decline.) But despite this steady showing, worldwide home Mac sales still fell 4.6 percent. Last July, Apple reported that Mac sales nabbed 4 million units, making for a new June quarter record. The iPad? It achieved 17 million, a new all-time quarterly record.